These Valencia Almond are fried and salted; no added herbs or spices, just plain fried and salted - just fine they way they are. 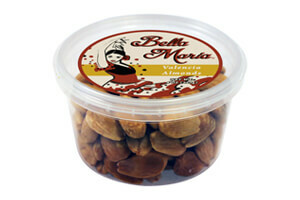 The Valencia Almond may be second to the Marcona almond, but it is a delicious gourmet nut that will be a satisfying snack. This small tub contains 4 oz. of these large fried Spanish Almonds. Enjoy them as a snack or try them in your recipes. Ingredients:blanched Valencia almonds, sunflower oil, sea salt.